You want to settle into their comfy leather recliners and not get up again. If I could put a rocket on their recliner and fly home, life would be perfect. Too bad we have to drive three hours home with four kiddos in the back – that’s a whole other level of fun. Talk about gratitude. We are so thankful for her cooking. You don’t want to go empty handed to a holiday feast, so here are some ideas for hostess gifts you could bring. 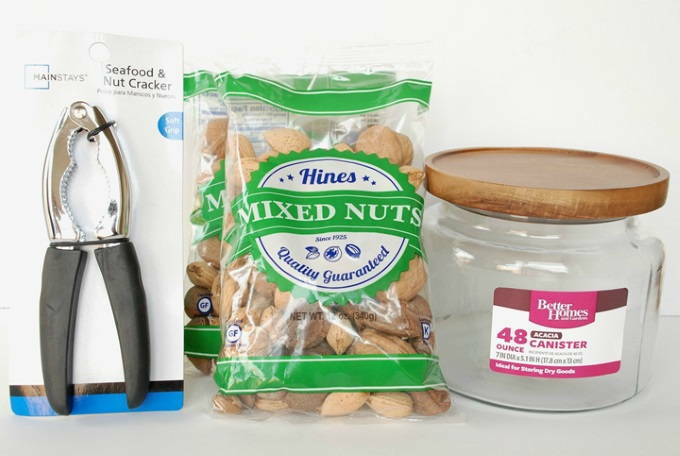 This pretty gift (of nuts and the cracker) was really easy to put together. The hardest part was picking just the right container. Walmart has lots of choices for canisters. But I was really impressed with this glass one in housewares. The top is an attractive acacia wood. Its earthiness goes really well with the nuts. It has a rubber seal so it should stay very airtight. It’s about six inches wide. This nutcracker looks like it could do some killer cracking. Can be used for seafood too, it says. They sell bags of nuts in this mixed variety or each variety alone. You could get a bag of just almonds if you wanted. 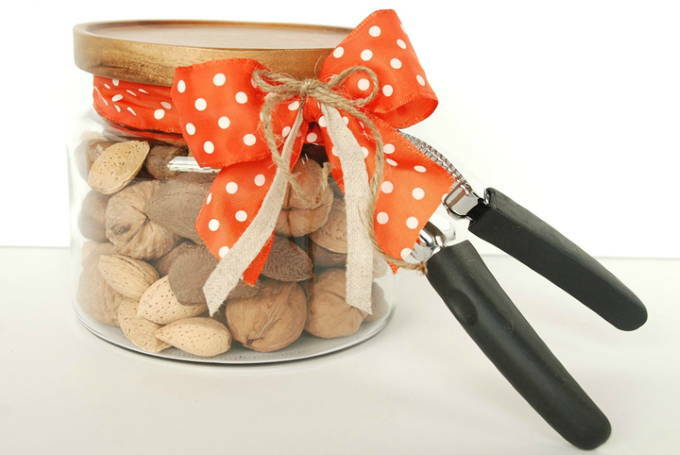 I filled the canister with the nuts (took two bags) and tied the cracker on with a bow. That’s when all of a sudden my kids decided they LOVE nuts. And they really wanted to crack open their own nuts. Hint: why give them away when we can eat them? I know it’s tough, but you have to actually give the gift to the host – not keep it for yourself. 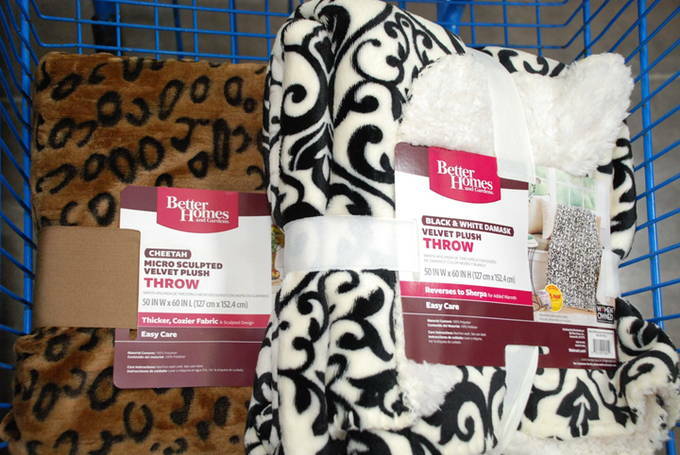 Walmart has outdone themselves this year in the throw blanket department. They have quite a variety – they’re all pretty, upscale, and SOFT. I’m talking stick-your-face-in-a-baby-lamb’s-wool kind of soft. Once you’ve touched this there’s no going back to a regular throw. These are two I fell in love with. The damask one is thicker than the brown one so the price is a little higher. You may find them in the housewares area or in the Christmas beauty gifts area. Another nice gift is this indoor mum. 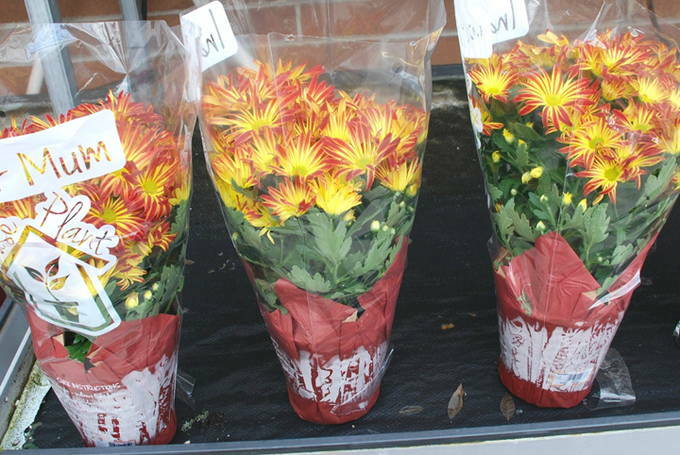 I saw lots of outdoor mums that were suffering in the garden center from cold damage. I was about to leave when I spotted these glorious plants. 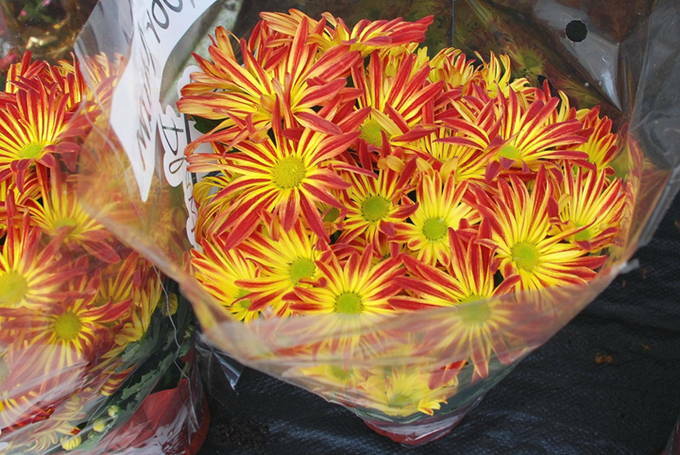 They were so fresh, colorful, and large (about 2 feet tall). The price is downright ridiculous – $6.88. I have bought plants in the winter and kept them alive until I could plant them outdoors in the spring. It doesn’t always work, but I try. 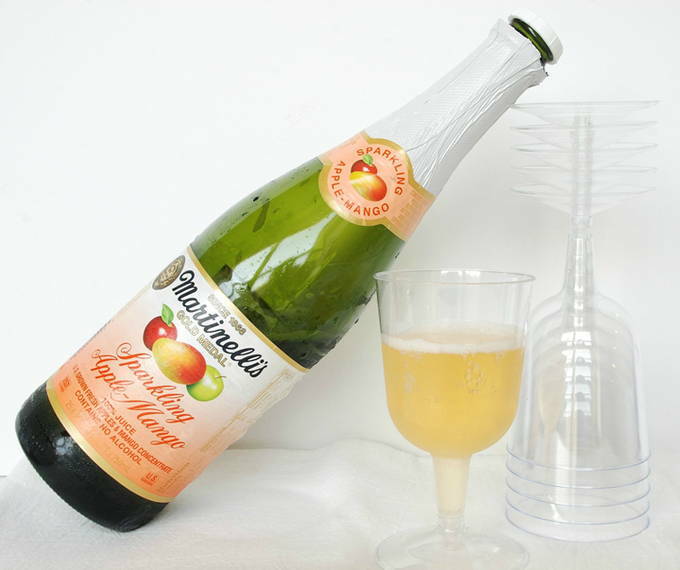 We love sparkling cider. 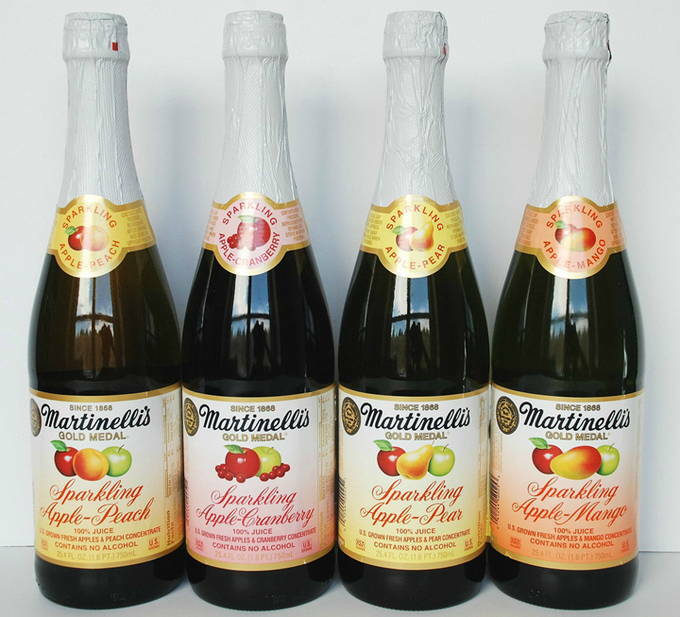 This brand sells several flavors during the holidays. We bought four flavors thinking we’d love them all. Thank heavens for apple-mango, which we liked – a lot. It had a medium flavor of mango, not too heavy, not too light. We are fans of mango though, so keep that in mind. But, don’t judge it by the first sip, have a few before you give it a verdict. It’s surprising at first and then you warm up to it. This would be an especially great gift for a family with children. We tried three other flavors, but were disappointed with how they tasted. The apple-peach was very heavy on the peach flavor, almost like it was syrupy. The apple-pear tasted like over-ripe pears. And the apple-cranberry was squeeze-your-lips-in-like-a-fish super tart. So, apple-mango saved the day. 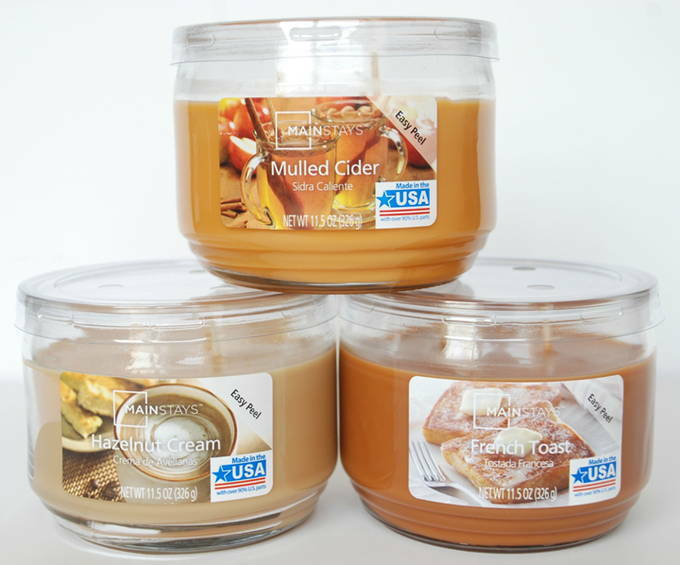 These three candles really smelled like fall to us – we instantly liked their scents in the store. We have been known to toast marshmallows over these candles. Each candle has three wicks and are about three inches wide. The Mulled Cider smells like warm apple cider/wassail. You definitely pick up on the cinnamon, other spices, and cooked apples in a wassail. The cider was a teensy bit on the strong side for us. The Hazelnut is like smelling a cappuccino. My daughter thought it reminded her of a hazelnut cookie. It was not as strong, more on the neutral side. Ah, now the French Toast was our winner. It smells like my kind of French toast, where you definitely taste the cinnamon and nutmeg but not too heavy on the spices. It was a nice smell to us – not overwhelming. It fell sort of between the cider and hazelnut. We were quite taken with it. I’m sure your host will be thrilled if you want to spoil her – and these items give you some good options.